August 19 Quiz — Should you spray this? Crazy infestations get the trigger finger itchy. 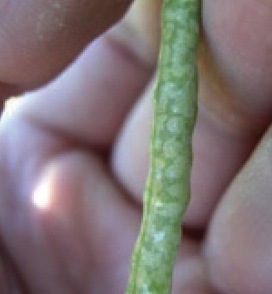 What would you do if you saw these in a canola field? Still wondering when to swath uneven crops? If earliest plants in a field show obvious signs of maturity, with lots of seed colour change on the main stem, then cut the first two rounds. Two full rounds give a good impression of the state of the whole field. And the cleared space makes it much easier to quickly check a number of plants in a few areas — including the back of the field — for seed colour change. Tangled mature canola fields can be hard to scout. Swathing two full rounds before scouting makes it much easier to quickly check a number of plants in a few areas — including the back of the field. Here are things to look for…. (1) When spraying and prior to swathing or straight combining, stick to the pre-harvest interval (PHI) unique to each product. (2) Remember that canola buyers will be asking producers to declare if they have used quinclorac this year. (3) When prepping bins, follow canola storage recommendations. Swath or straight cut lodged crop? Whatever the cause for lodging — wind, rain, late-season hail — the crop will present a harvest challenge. Swathing low to the ground doesn’t leave much stubble to hold the swaths in a wind. Swathing lodged crop often leaves a lot of bunches in the windrow. And lodged crop may need to be swathed in the same direction. Neither of these scenarios is ideal. 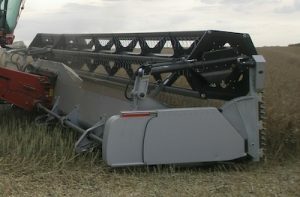 Specialty headers designed to straight combine canola seem to provide an improvement over standard straight cut headers. These specialty headers have the cutterbar out in front of the reel to catch seed that drops on impact from the reel bats.